While I was going through Максим Сырников and Елена Молоховец books I found many dishes that really resonated with me. Russian sorrel soup, pumpkin millet porridge, syrniki. At the end I saw something I couldn't leave there. These were crucian carps in sour cream, a very old Russian fish recipe. I had this dish long ago. When I was still a child I visited my friend at her grannie's country house. Her uncle went fishing to the river and came back with a bunch of fresh crucian carps. Her grannie fried them to crisp and then cooked in melting sauce made of onions and sour cream. It tasted unbelievable and once I saw the dish in the book I immediately felt it in my mouth again. When it came to realization I found that there were no crucian carps available close to my parent's house (perhaps I'd need to get to Dorogomilovsky market to get those). So I tried the dish with guilt head bream. Guilt head bream is larger, softer and fattier than crucian carps. 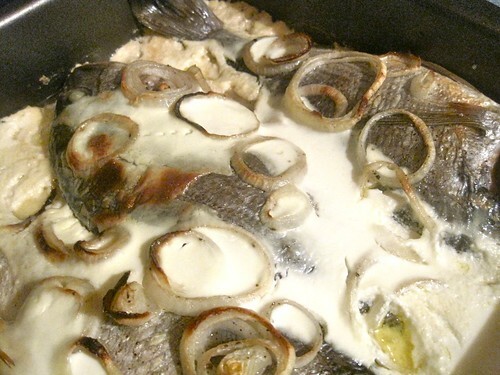 But that special taste formed by the baked fish, onions and sour cream cooked together still came out. Everybody in the kitchen felt something forgotten long ago just came back. Scale and disembowel each fish and take out the gills. Rinse well with water and dry with a paper towel. Brush the fish with oil and season well with salt and pepper both inside and outside. Place the fish into a baking tray. The tray should be just large enough to hold the fish in one layer. Cover with sliced onions and thinly sliced butter and bake at 180C for 15 minutes till golden and crisp on top. Combine the sour cream with milk and salt to taste. Take the fish out of the oven and cover with the sour cream mixture. Return to the oven for another 20 minutes. When ready, the fish should be very tender and melting. And should get that special aroma I bet you'll recognize when you get it. Serve right away. If you feel like garnishing it, boiled/baked/mashed potatoes will do fine. This time we had it on its own and it felt totally self sufficient. Mmm! I haven't had that in such a long time but I'm going to make some this weekend. We use mayonnaise instead of sour cream though. But it still has that delicious taste!